SOLANA BEACH –Rather than continue to seek a waiver for the installation of about 30 percent of the required story poles for the complete remodel of an apartment complex, the developers have devised a new system to indicate building sizes. 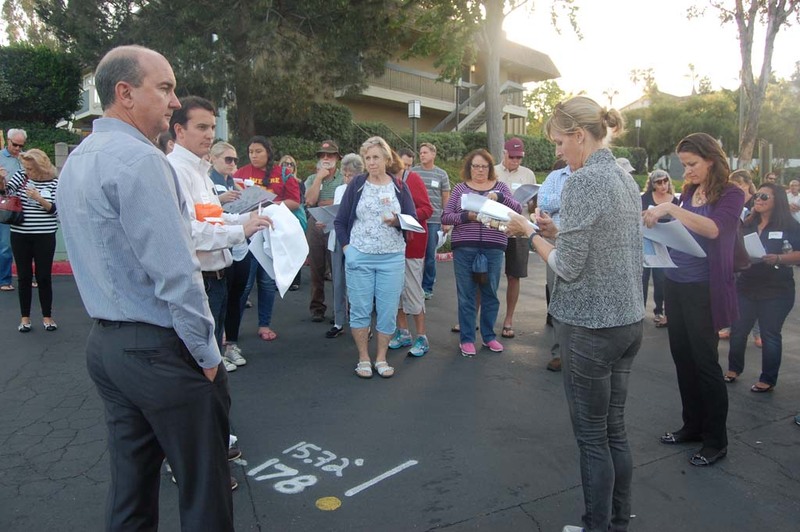 The plan was introduced at a March 15 public workshop at St. James Academy, adjacent to Solana Highlands on Nardo Avenue. “We had to be a little bit creative because (of) safety issues,” project manager John La Raia said. “Now we have a different way of doing it to make sure you see the corner and the sides of the buildings. “The plan isn’t perfect but it’s the best that we can do with the situation that we have and maintain the safety we need to onsite,” he added, noting that the revised plan will provide a visual representation of the buildings for an extended period of time. The new system will use triangulation. “We had to be able to show the corner of a building in the middle of the drive aisle without having a pole there with wires that would block access to emergency vehicles,” La Raia said. Support poles with a wire going across them will be placed on either side of the drive aisle. Where the building corner is you will have some sort of indicator, such as a flag, dropping down at the corner. There are a few areas where the new system still couldn’t be accommodated. In those minimal situations, the story poles will be either under- or over-exaggerated. La Raia said the new plan will use color coding and a legend. Solana Highlands, built in 1972, currently has 194 one-, two- and three-bedroom units. About 30 units will be classified as low-income. Plans also include a significant increase in onsite parking, from about 285 spaces to 525. Construction will take place in three phases in approximately 36 to 40 months. Plans were introduced more than a year ago. As the developers began the process of installing required story poles in January they discovered some of the poles and related support structures would be in driveways, fires lanes and parking spaces. During an onsite visit the fire chief and fire marshal confirmed that many of the poles, if installed where proposed, would create a public safety hazard because they would make it difficult or impossible for responders to access the site. At a March 11 meeting the developers asked City Council members to allow them to install only 70 percent of the 182 required poles. Many residents opposed the request, saying they needed to see a complete picture of the proposed remodel. Council members opted to continue the public hearing so the developer could hold a workshop and refine the plans. About 40 people attended the workshop and seemed to support the new system. “This is a much-improved plan,” Adrienne Davenport, who lives across the street from Solana Highlands, said. “What they were asking for before wasn’t appropriate. I appreciate their response to the community and their efforts. Another resident was less supportive. “If the pole is not where the building is going to be it’s going to be hard to get an idea of the impact,” she said. “The residents have legitimate concerns,” Gerri Retman said. “It sounds like the developers are listening but we’ll have to wait and see. H.G. Fenton will present the new plans during a special council meeting May 6. If they are approved, story poles could start going up within a week or two after that. It will take about as long to complete the installation. Once that is done the developers plan to hold workshops to address questions and concerns. To accommodate residents’ schedules the meetings will be held on various days at different times. La Raia said he also will meet with residents by appointment if none of the workshop times are convenient. The poles will remain in place for at least 30 days.